Series rookie Dean Stoneman produced a stunning drive to finish 5th in his first ever Indy Lights oval race. 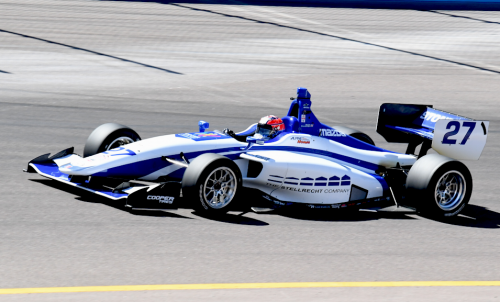 The Andretti Autosport driver arrived at the Phoenix Raceway for his first oval race determined to build on a solid Indy Lights debut in St Petersburg, Florida where he picked up points in his first outing in the Stellrecht Mazda. The weekend started off extremely positive for the 25-year old in practice one after finishing the session in an impressive third place. The second practice was used to simulate a race run setting, but still Stoneman was just two tenths off fastest in seventh. Qualifying was a three-lap shoot out format that Stoneman was experiencing for the first time. Despite strong earlier practice times the 27 car qualified in 9th place, just two and half tenths of second off pole. For the race, Stoneman was eager to make up places from the rolling start on the fifth row.. and he did just that. After the first of the race’s ninety laps the 27 car had already moved up to 8th place. From there he was hunting down 7th and on lap twenty-nine he had secured that place with a eye now on the place ahead. The field bunched up thanks to a safety car following an incident. From the restart Dean used this opportunity to make a jump on the sixth place car ahead of him. Dean was then on a charge and all eyes were on him as he became the fastest car on track with a average speed of 161 mph as he looked for every way possible to get past the 5th place car. Then the British rookie dived low before going high on the oval track and wrong footing his rival and finally moving up into 5th with a overtaking move way above his experience level on ovals, much to the delight of the race fans and the Andretti team. Dean now turns his attentions to the next race in Barber Alabama 24th and 25th April.